Are Businesses ‘Waking Up’ to the Role of Blue Light in Sleep? An estimated 83.6 million sleep deprived people are shuffling around the U.S. at any given moment – so it makes sense that businesses are investing in products and technologies that focus on ways to get a good night’s rest. When smart lighting entered the market, it made changing the color temperature of lights easy. With the touch of a button, users could program their lights to wake them up slowly, like a sunrise. Apple’s recent update to iOS 9.3 introduced Night Shift, a feature that takes its cues from the sun (or more specifically, your device’s clock and geolocation) to gently shift the color temperature of your display to the warmer end of the light spectrum at night which may help you get a better night’s sleep. Blue light, a naturally occurring wavelength emitted in sunshine, was manufactured into light emitting diodes (LED’s) by three Japanese scientists in the early 1990’s, an invention so innovative that it led to a Nobel Prize in Physics in 2014. Smartphones, HD televisions, computers … all of these devices are enhanced by the brilliant light of this technological marvel. Does Blue Light Mess Up Sleep Patterns? The theory is that the blue light does such a marvelous job of mimicking the sun, that it “tricks” our brains into thinking that it is still daytime. Currently, there’s not enough data to definitively say that the blue light from devices is what is keeping people awake at night. Rather, maybe your wakefulness is a result of too much mental stimulation from playing a game, or just plain worrying about some email that you checked right before you went to bed? Although the jury is still out on whether or not screens emitting light on the blue spectrum actually disrupt natural sleep cycles, Apple’s latest release may be a catalyst for more discussion on the side effects of late night screening. What do you think? Have you tried Night Shift, or products that do something similar? Has it helped you get a better night’s rest? There are many design considerations when choosing a step light for your project. To help navigate through the many choices available, we turned to a professional landscape lighting designer. 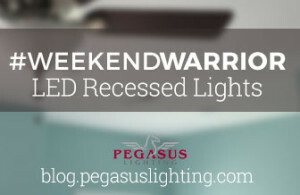 According to David Bilik, owner of Twilight Designs in Las Vegas, flush mount (recessed) step lights are often the fixture of choice when used indoors. He credits this to how easy it is to cut into and run wiring through drywall, especially when installing step lights after construction is completed. “While planning ahead is helpful,” says Bilik, “there are many products available for running wires post-construction.” He recommends 110v wiring to fish through walls and attics or low voltage wiring when 110v is not an option. For less penetrable surfaces like concrete and stone, surface mounted fixtures are ideal because they mount directly to a wall or flat surface. These step lights commonly have a profile of as little as 3/4-inch up to 3-inches and a trajectory that directs light at the wall or at the surface below. An open-faced step light will offer the most amount of light with only a frosted glass lens to soften glare from the bulb. There is nothing to deflect or redirect the light with an open-faced step light, so proper placement is crucial as to whether or not the fixture will complement the design elements of the area, or overwhelm the space. Avoid this by mounting the fixture to the left or right of a staircase instead of on the face of a step. Louvered fixtures have a cover that functions much the same way as an air vent in your home or car would. They have a grated cover that directs the light down. Although a louvered faceplate blocks the most amount of light, it is ideal for mounting on the front of a step as they mount flush with the surface and block all glare. Shrouded fixtures capture the light coming out of the front of a fixture and redirect it down, focusing the light on the ground where you need it most. However, even with flush mounted fixtures, the shroud itself still sticks out making this fixture unsuitable for mounting on the front of a step. Although LED fixtures are becoming more popular, a lot of step light fixtures are still outfitted for conventional light bulbs, but this does not mean that you are saddled with inefficient lighting. Retrofitting a conventional fixture with LEDs is sometimes as easy as changing a light bulb. “Look for LED bulbs that are direct replacements for their conventional counterparts, and use socket adapters when necessary,” says Bilik. Many step lights are universal in size, meaning they are designed to fit within a single gang electrical box. For landscape lighting designers like Bilik, this makes the process of upgrading to LED step lights simpler and more cost-effective for the client. 25,000 LED lights, intricately programmed on a network of complex algorithms, will soon dazzle the San Francisco Bay area on the largest LED light sculpture ever created. But it won’t be the first time. In March of 2015, after a two-year-long display, it was “lights out” for the beloved Bay Lights Project, an iconic architectural light sculpture dreamed up by non-profit organization Illuminate.org and made reality by renowned artist Leo Villareal. The original project, which ran from March 2013 to March 2015, was deconstructed when the permit expired, allowing the city to do maintenance work on the cables. Illuminate immediately went to work raising the $4 million needed to ensure that the bridge would be re-lit. In November 2014, the spotlight was on the heavens, maybe even in the way that Michelangelo envisioned it himself. One year later, Osram sat in the spotlight for their role in the innovative lighting solution that made it possible. 500 years after its completion, The Sistine Chapel underwent a lighting renovation that has changed the way we see this historical masterpiece. Finding the right product and installation that offered a glare-free experience with no degradation of the original artwork was no small feat.